This set of tasks has been inspired by team-work activities. We changed its focus and concentrated on language skills. We developed it for a series of critical thinking courses in Czech, English, French and Spanish in 2009. It has been used in a variety of courses for different purposes since, for example for creative thinking, academic writing style, communication patterns or vocabulary building, but I believe it can be adjusted to a great number of other purposes. The activity is divided into three stages: pre-session; in-session; and post--session, where pre- and post- activities can be easily done online. The in-session part is manageable in one 90 minute session, but it is preferable to have more in-class time to achieve better results. So, we can use it in a series of sessions, and we could even build a whole course around it. III.2. write a piece of text (350 words max.) that explains why this particular bridge has been chosen. Share results of your research with the rest of the group. 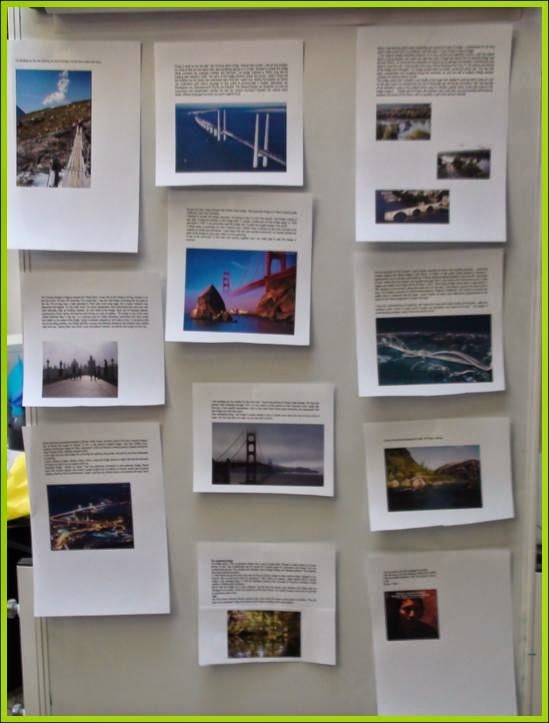 "I was shocked by number of types of bridges, for example: cold, crane, erection, highway, pivot, resonance, protective, solder, segmental, lift, lighting, magnetic, ore, hydrogen, induction, suspension bridge, cantilever bridge, viaduct, rope bridge, humpbacked bridge, arched bridge, mobile bridge, funicular bridge, railway bridge, overpass, eco-duct,…"
a) "Bridge is defined as a structure spanning and providing passage over a gap or barrier, such as a river, a roadway or a valley. We also often use an explanation as bridge in its abstract form, to connect different ideas or attitudes to reach reciprocal understanding. Bridge is also the card game, usually played by four people in two partnerships. Wikipedia says that there are six main types of bridges: beam bridges, cantilever bridges, arch bridges, suspension bridges, cable-stayed bridges, truss bridges or retracting bridges, and then that designs of bridges vary depending on the function of the bridge and the nature of the terrain where the bridge is constructed." b) "When you say "a bridge", the first thing that comes to my mind are the lyrics of a great song named Like a bridge over troubled water, especially and among others song by Johny Cash. Without having those human bridges people use to drown in feelings of helplesness and fear. Bridges are constructions that hold two safe and solid places together, help you to overcome places of instability and obstructions. They connect known and unknown, make from unknown familiar. They are crucially important in everyday life." c) "Bridge could have many different meanings, if I´m builder, bridge is for me an object connecting mostly one side with the other side e.g. over the river, highway...but bridge could be also for visitors at parks and gardens to admire their beauty, watch fish, water plants...Bridge can also have humanity meaning if organisations and groups form an airbridge to send aid to the people who needs it as after earthquake on Haiti.Love can bridge arguments, or different opion of family members.U can burn your brigde, if U split up with your ex and is really painfull and hurts your feelings. As a gymnast you can do bridge as a part of your performance and exhibition or show. If you don;t look after your teeth your dentist probably suggest you to have an bridge to save ur teeth. Most of the yachts have bridge for a captain to see over the horizont, when yacht sail." "First, let us consider some technical parametres: Located in Busan, South Korea, it connects parts of the city in the second largest city of Korea.The length is almost 7.5 km; it is the second longest bridge. Its construction began in 1994 and was finished in 2002. It cost billions of wons (Korean currency). It was first used during the Asian Games 2002, but officially opened a year later, in 2003. In the night you can see the bridge as a brightly shining long snake. Sailing on the boat underneath is amazing. I adore those millions of lights, flashes, lamps and neon lights but, at the same time, I am also aware of the fact that such an amount of energy could be used differently. I am sure it could supply a small city with light. I have also chosen the Gwangan Bridge because I have nice memories connected to that particular bridge. A beach party with Korean people, who did not speak any English, and me with five Korean words was amazing. We were singing, dancing and performing because it was the only way to comunicate with one another. I hope I will be able to come back and enjoy the bridge again in the future." This practical section provides students with an opportunity to use language in a realistically communicative situation: they have a goal and they have to communicate effectively in order to achieve that goal. Students can use the preparation from the pre-session activities; but this experience is also essential for all post-session activities. 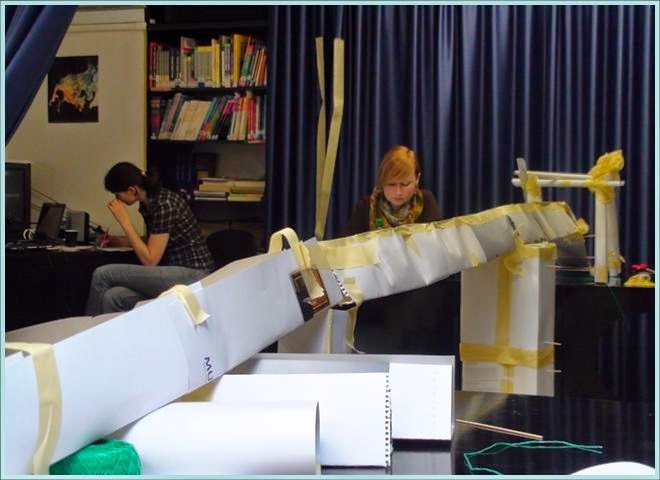 The aim of the BRIDGE activity is to build a construction that will connect two river banks (two desks) in a given height and will prove it functionality by a car drive trial. Prepare your plan for the bridge construction. Decide about each participant’s responsibilities, about the material use and organisation of the construction. The material and two river banks (two desks) can be investigated but not changed in this phase. The car can be tested. Divide your group into two teams – each will be working at one river bank. This division is irreversible. You will get the material on request at the beginning (no other material will be provided later). The material will be divided according to the needs of each team. The material division is irreversible. COMMUNICATION LIMITS: The language of the bridge construction is English: any use of other languages will be penalised by cuts in the allotted time. SPACE LIMITS: Each team can operate on one river bank. This means none of the constructors can enter the space between the two desks. The only person who can enter the river (the space between desks) is a “diver”. DIVER: Participants choose the diver before the construction phase. The diver is one person. This only person can enter the river (the space between the desks) as many times as they want but can stay in the area between the desks for 3 minutes max. – all enters together. The diver can do any type of activity in the river. a) The bridge construction must be situated minimally 15 cm above the river banks (the desks). b) The bridge construction can be constructed, erected, tilted or moved in any way but cannot go over the bank borders. c) Once the construction touches the bank border, the connecting operations can be done by any participant(s) working on the given river bank. The construction quality is tested by the car. The test is successful when the car crosses the river on the construction in the following way: the car must start before the construction on one river bank, then go on the bridge across the river, and finish on the opposite river bank, off the construction. 1.5. Reflection of the Task 1. Discuss the activity and its results from as many perspectives as possible (personal feelings, quality of the material used; quantity of the material used; the team expertise, the team cooperation; the methods used; time management; results; consequences). This part depends on the original purpose of the whole activity. 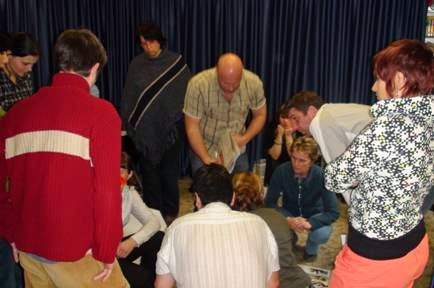 We can finish whe whole experince with a reflexion of what was going on (in-session part - 1.5. ), or we can develop one or more tasks based on students´ experience. How are you? I’ve heard you had a bridge construction session – what was it like? Did you enjoy it or …? What did you do? Have you learnt anything? Let me know since I think we are going to do a similar thing so, I’d just like to know what to get ready for. Work in the group. Prepare for a panel discussion on the topic of the construction of the bridge. You will be divided into three groups: panel members, audience, organisers. Each participant will prepare their role (choose your own perspectives or professional expertise and use all the information based on all the research articles, newspaper articles and reports written in this course). The panel discussion will take 60 minutes. Task 6 Reflect on what you have learnt. Learning to spell helps to cement the connection between the letters and their sounds, and learning high-frequency "sight words" to mastery level improves both reading and writing. English writing system is not merely to ensure accurate pronunciation of the written word – it is to convey meaning.According to me one of the best sites which helps in learning spellings, meaning and pronunciation is www.vocabmonk.com.